Students in the Pre-Employment Police Basic Training Course must be advised of several conditions of this training program that will affect them during and after attending the program. Through this notice, the school is advising the student of these conditions as required by the policy established for this program by Division of Criminal Justice Services. Completion of this program is not a guarantee of employment as a police officer. To complete this pre-employment training program, a student must participate in physical fitness training and successfully complete a physical fitness examination. 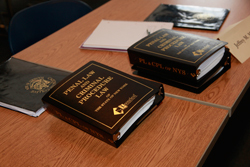 To complete this pre-employment training program, a student must comply with mandated New York State regulations that include: strict attendance requirements; maintaining a notebook; and passing written examination/s. This is a two-phase program. The first phase is conducted pre-employment and the second phase is conduct after appointment as a police officer. Each individual phase of this training program must be completed as a single and cohesive unit. This means that students must complete the phase of the program at one institution. The following phase may be conducted at a separate institution. Before being appointed as a police officer, a person must complete New York State Civil Service requirements and appointing agency hiring standards (including minimum and maximum age and residency requirements) by taking a written examination and scoring high enough on the eligibility list to be considered for appointment. Before being appointed as a police officer, a person must take and successfully complete a physical fitness examination. Before being appointed as a police officer, a person must submit to a medical examination, which may include drug screening. Before being appointed as a police officer, a person may be required to submit to a psychological examination. Before being appointed as a police officer, a person with criminal conviction or with a felony conviction may be disqualified from employment. Before being appointed as a police officer, a person may be required to submit to a background investigation. Upon appointment as a police officer, a person will be required to satisfactorily complete additional training. Failure to complete this training will result in denial of certification by the New York State Municipal Police Training Council. The certification is required by § 209-q of the General Municipal Law for police officers to remain in their positions. Pre-employment training will be valid for two years after completion of this program. If a person is not appointed before two years has elapsed, they will be required to attend a Police Refresher Course. After ten years from the date of completion records on the transcript, the training will no longer be valid (this is consistent with the provision of §209-q of the General Municipal Law pertaining to police officers).